Premium Package is a special benefit plan available only for the best vehicles. Purchase a car with Premium package to ensure the best safety and reliability. Mechanical break down warranty up to either 3 months of arrival at the port or 6,000 km. You vehicle is covered by Trust' guarantee. Click here for warranty details. 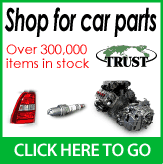 All mechanical checks repairs using genuine parts. We perform mechanical check ups on 37 items for road worthiness required annually by law in Japan and service and repair your car if necessary after the inspection. Four brand new tyres fitted. Branded quality tyres are fitted instead of the old ones, that are discarded. Engine oil, oil filter, air filter and AC filter change. Filters and oil are changed to ensure the maximum reliability. We use high quality oil from the maker. Spare key sent by Air Courier. The spare key is sent to you by Air Courier, safely and quickly. If the vehicle has only one key, we will make a new spare key equivalent to the original main key.